Designed by Enrique Puertas and released in 2010, VDownloader is a free software for downloading videos from the Internet. It supports several sharing websites. Since it supports multiple sharing video websites, be sure that you are going to be able to download files from Youtube, Dailymotion, Metacafe, Vimeo, LuluTV, GoFish, and many more. VDownloader is able to download multiple videos at once, regardless of their language and/or size. 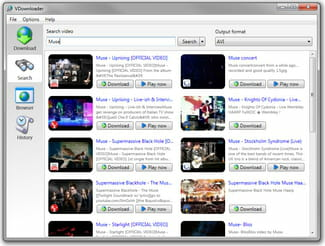 On its intuitive interface appears a search box in which users just have to enter keyword for the corresponding videos to be displayed instantly. Note that the results can then be sorted according to your needs. VDownloader has its own browser so as to quicken search for videos. What makes it interesting is that it is possible to have access to blocked videos through integrated proxy. Finally, VDownloader allows you to manage your downloads and convert captured video into one of the following formats: AVI, MKV, MP4, MPG, 3GP, VCD, SVCD, DVD, FLV and MP3. If you plan to transfer your videos directly to your mobile devices, it can also convert them into formats compatible with iPod, iPhone, iPad, PSP and Nokia N800/N810. VDownloader is autonomous and easy to use. There are some limitations for this trial version. Batch downloads not available. Latest update on December 3, 2016 at 12:34 PM.